October 26, 1932: “The Gumm Sisters” performed at a “Stage and Screen Spectacle” benefit for the M. Sinai Home for Invalids at the Shrine Auditorium, Los Angeles, California. October 26, 1933: “The Three Gumm Sisters” performed at the Safeway Employees’ Association Benefit at the American Legion Stadium, Hollywood, California. 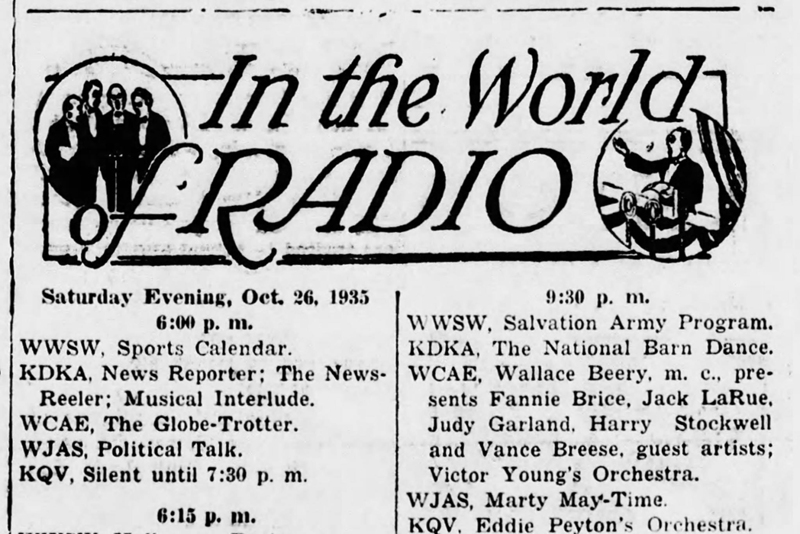 October 26, 1935: Judy’s first official MGM-related work: Her national radio network debut on Wallace Beery’s “The Shell Chateau Hour” broadcast by NBC Radio from the KFI Studios in Los Angeles. The show lasted from 6:30 to 7:30 p.m.
Beery introduced Judy as only twelve years old when in fact she was well past her thirteenth birthday. She sang MGM’s latest hit, “Broadway Rhythm,” while her parents, Frank, and Ethel Gumm, and her sister Jimmie, watched from the audience. It has been available on various LP and CD releases, including the 2015 CD “The Best of Lost Tracks 1929-1959” in which it has been expertly remastered. 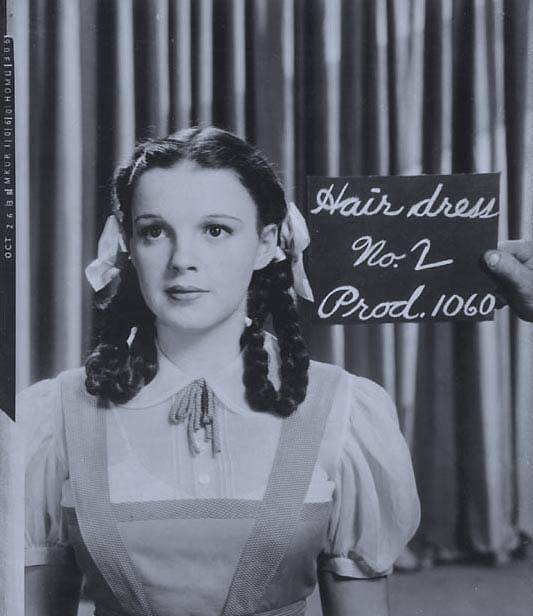 October 26, 1938: Judy endured new hair and makeup tests for The Wizard of Oz under the temporary direction of George Cukor. These tests included some using her own hair with braids and some with other blond wigs. She wore the same dress she had been wearing during the two weeks of filming (that too would be changed). Also on this day, the two articles above were published which were the first of many that detailed the production. 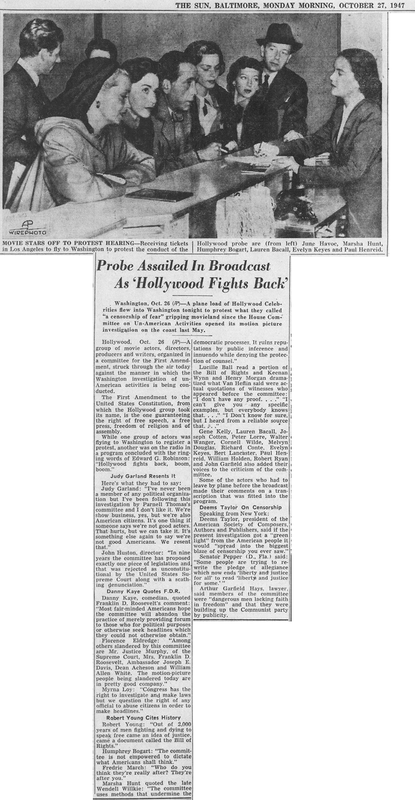 The first is Hedda Hopper’s story about visiting the set, the second is a fascinating report that is one of the few that details the early weeks of production under director Richard Thorpe and with Buddy Ebsen as the Tin Man. 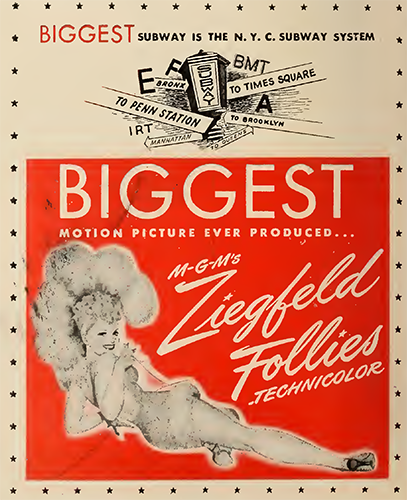 October 26, 1944: This promotional photo was dated on this date (but taken in July 1944) and sent out to various magazines and newspapers for publication as an early promotion for Ziegfeld Follies. 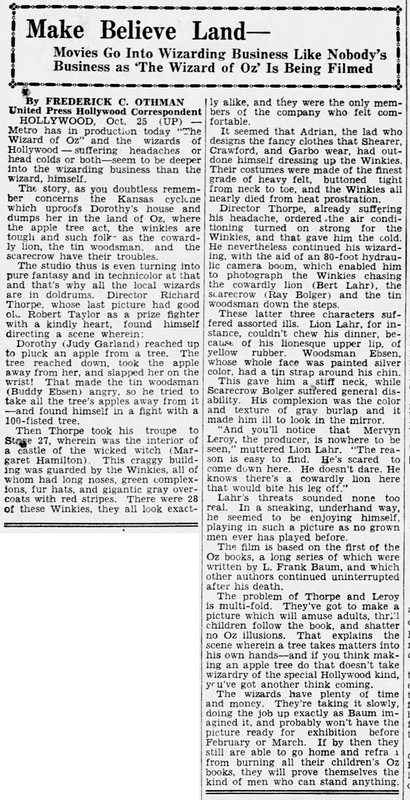 As it turned out, the film would not be in general release until 1946 due to various production delays and editing. 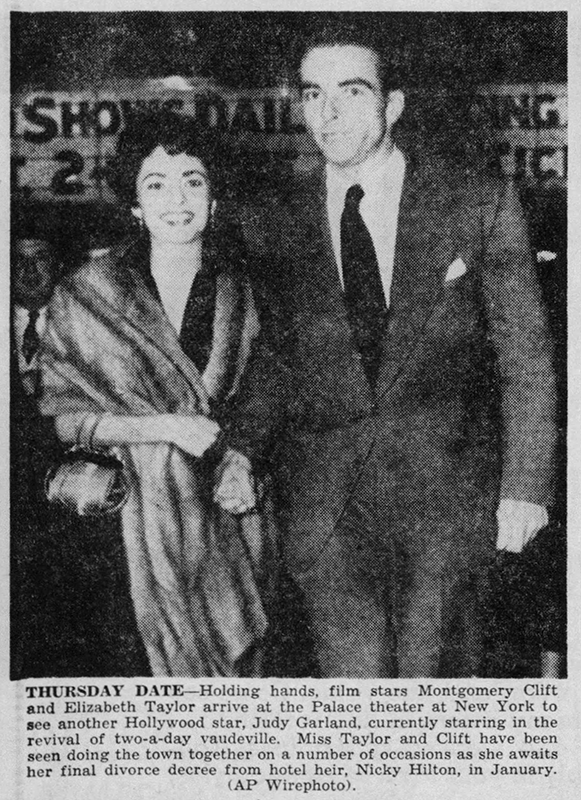 The ad above was published on this date in the Film Daily trade magazine. Also on this day, Judy had more filming on The Clock with scenes shot on the “Interior Hotel Bedroom” set. Time called: 10 a.m.; dismissed: 6 p.m.
October 26, 1945: Judy was sick on this day and did not report to work on Till The Clouds Roll By. She had been shooting the “Who?” number. 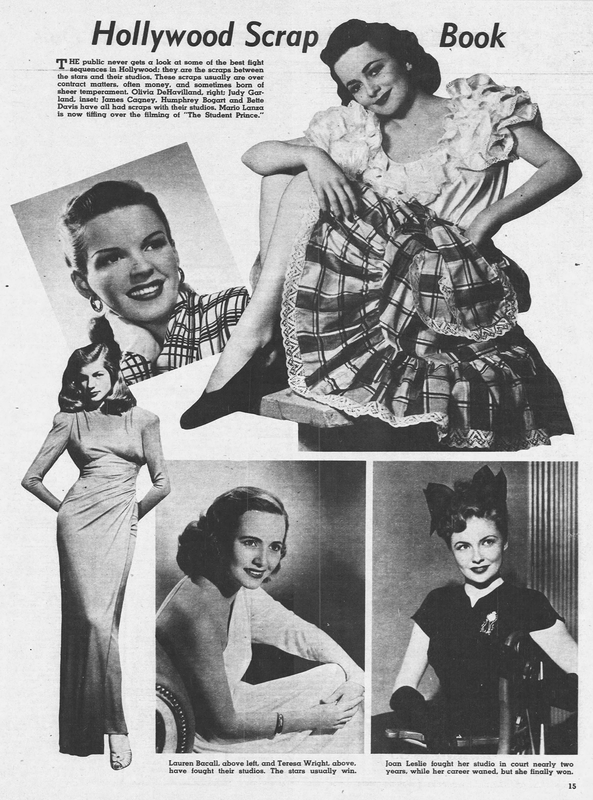 October 26, 1947: The “Sunday Mirror” magazine. October 26, 1951: Judy’s phenomenal comeback at The Palace in New York wasn’t just a hit with the public, she was also a hit with her peers and everyone else in show business. 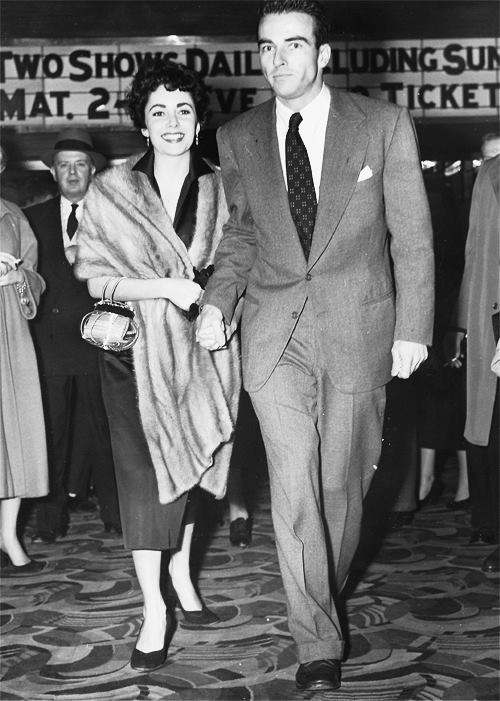 Elizabeth Taylor and Montogomery Clift went on a “date” and saw Judy’s show on October 25th. This photo of the two at The Palace hit newspapers across the country the next day. 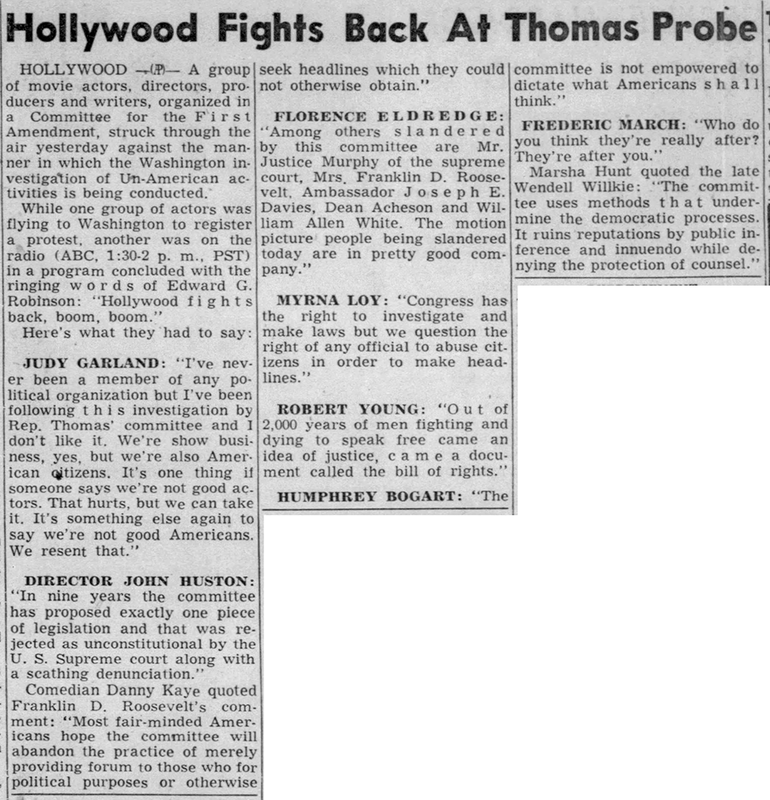 October 26, 1952: Hollywood Scrap Book. 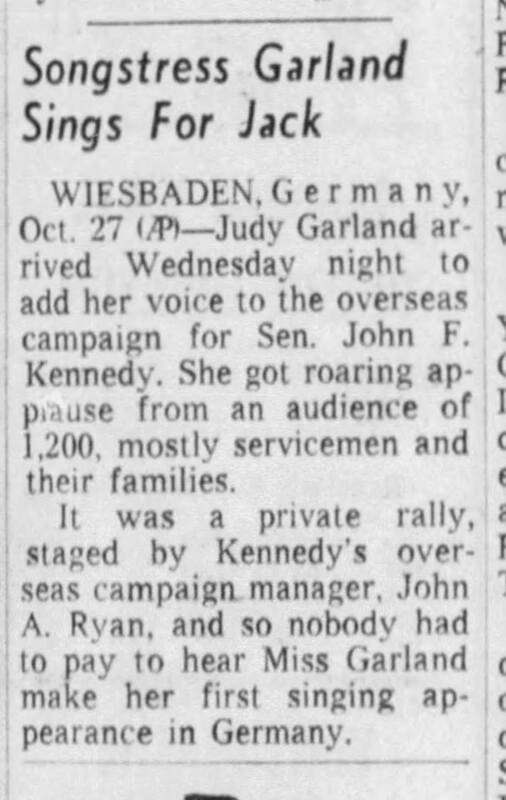 October 28, 1960: While in Europe, Judy took time out to travel to Wiesbaden, Germany, for a “Koncert For Kennedy” (John F. Kennedy, who became a good friend). That took place on October 26, 1960. Judy’s next stop, her October 28, 1960, opening at the Olympia Theater in Paris. October 26, 1961: Judy’s slacks are in poor taste! This reader review appeared in the Pittsburgh Press newspaper. 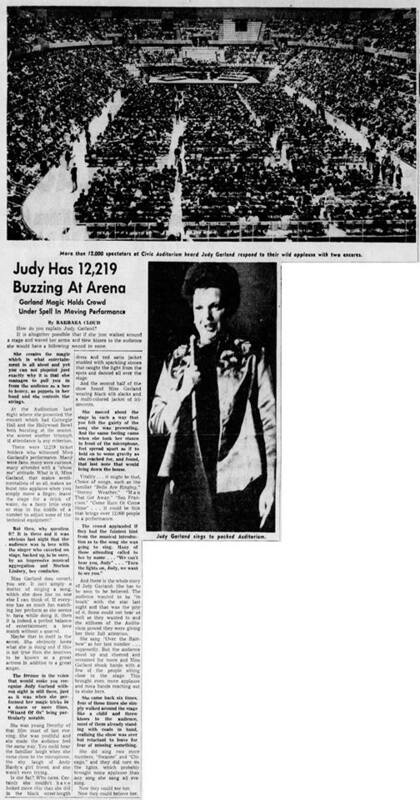 The reader is referencing Judy’s October 19, 1961, show at Pittsburgh’s Civic Auditorium and the paper’s review of it that was published on October 20th. In behalf of the many thousands of people who were thoroughly disappointed in the Judy Garland performance at the Auditorium, I feel it necessary to comment on Miss Barbara Cloud’s review in the Oct. 20 edition of The Press. It seems to me that Miss Cloud misinterpreted the general feeling of the audience. This who could not see and hear voiced their complaints in sheer exasperation. It wasn’t Miss Garland’s fault, but that of the set-up in the Auditorium. Certainly a runway could have been extended to allow her to be “in touch” with the audience. The Auditorium is not a theater or club, and it can’t be expected that the efforts of one performer will come across to 12,000 people in such a vast area when the stage is so far from the majority of the people. I might add that the center floor arrangement with little or no elevation of the seats, would also have been a more satisfactory arrangement had the runway been set up. As to Miss Garland’s repertoire, while she was magnificent in some of her numbers, many, in my opinion, were not at all impressive of her talents. Also, how Miss Cloud could feel that a black, street-length dress with a red satin jacket is chic for a performer of this caliber is beyond my reasoning. And, alas, slacks n the second half of the show was certainly in poor taste. Where was the glamor and style Miss Garland should have displayed for those who took the pains to dress up to come see her? 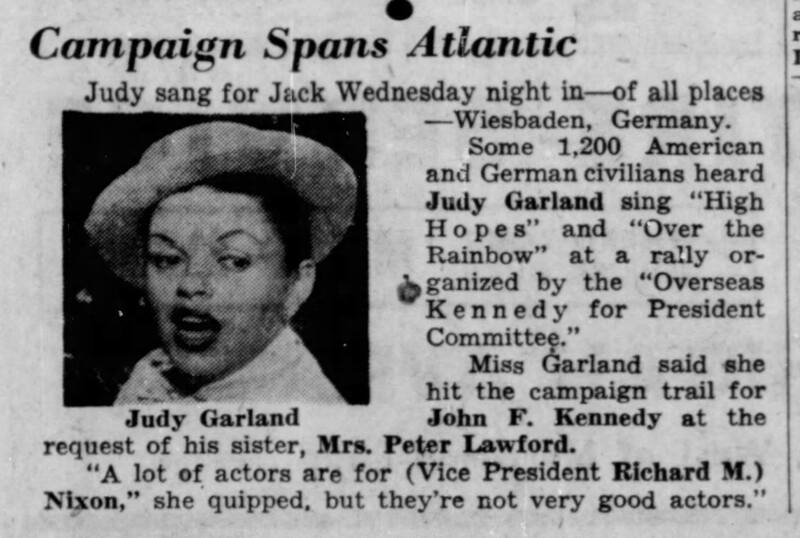 Truly, the many top fashions and hairdos on view that evening only served to make Miss Garland appear anything but chic. Surely, other critics who seemed to review the performance much more realistically, and the many, many people who left before the performance was far from over, speak for the fact that Miss Garland was not the Judy we had hoped to see. 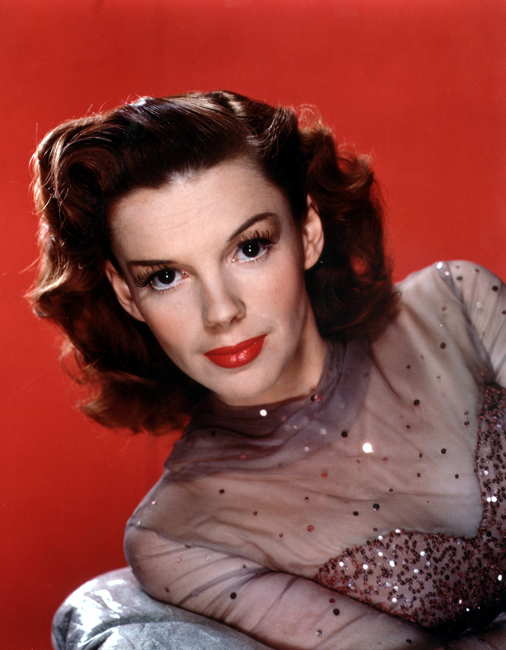 How do you explain Judy Garland? It is altogether possible that if she just walked around a stage and waved her arms and blew kisses to the audience she would have a following second to none. She creates the magic which is what entertainment is all about and yet you can not pinpoint just exactly why it is that she manages to pull you in from the audience as a bee to honey, as puppets in her hand and she controls the strings. At the Auditorium last night where she presented the concert which had Carnegie Hall and the Hollywood Bowl both bursting at the seams, she scored another triumph if attendance is any criterion. 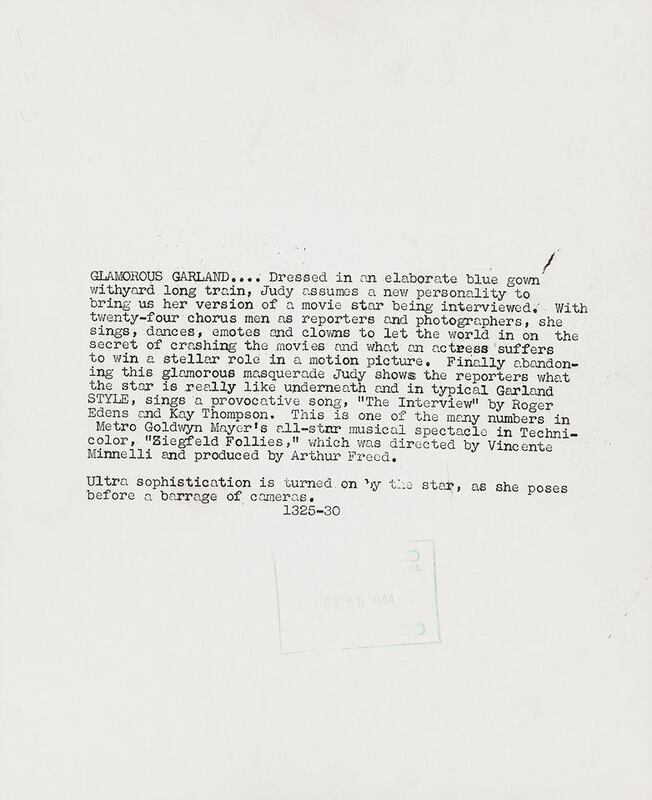 There were 12,219 ticket holders who witnessed Miss Garland’s performance. Many were fans, many were curious, many attended with a “show me” attitude. What is it, Miss Garland, that makes sentimentalists of us all, makes us burst into applause when you simply move a finger, leave a stage for a drink of water, do a fancy little step or stop in the middle of a number to adjust some of the technical equipment? But then, why question it? It is there and it was obvious last night that the audience was in love with the singer who cavorted on stage, backed up, to be sure, by an impressive musical aggregation and Morton Lindsey, her conductor. Miss Garland does cavort, you see. It isn’t simply a matter of singing a song, which she does like no one else I can think of. If everyone has as much fun watching her perform as she seems to have while doing it, then it is indeed a perfect palace of entertainment, a love match without a quarrel. Maybe that in itself is the secret. She obviously loves what she is doing and if this is not true then she deserves to be known as a great actress in addition to a great singer. The rumor in the voice that would make you recognize Judy Garland without sight is still there, just as it was when she performed her magic tricks in a dozen or more films, “Wizard Of Oz” being particularly notable. She was young Dorothy of that film most of last evening. She was youthful and she made the audience feel the same way. You could hear the familiar laugh when she came close to the microphone, the shy laugh of Andy Hardy’s Girl friend, and she wasn’t even trying. Is she fat? Who cares. Certainly she couldn’t have looked more chic than she did in the black street-length dress and red satin jacket studded with sparkling stones that caught the light from the spots and danced all over the stage. And the second half of the show found Miss Garland wearing black silk slacks and a multi-colored jacket of iridescents. She moved about the stage in such a way that you felt the gaiety of the song she was presenting. And the same feeling came when she took her stance in front of the microphone, feet spread apart as if to hold on to some gravity as she reached for, and found, that last note that would bring down the house. Vitality . . . it might be that. Choice of songs, scubas the familiar “Bells Are Ringing” [reference to “For Me And My Gal”], “Stormy Weather,” “Man That Got Away,” “San Francisco,” “Come Rain or Come Shine” . . . it could be this that brings over 12,000 people to a performance. 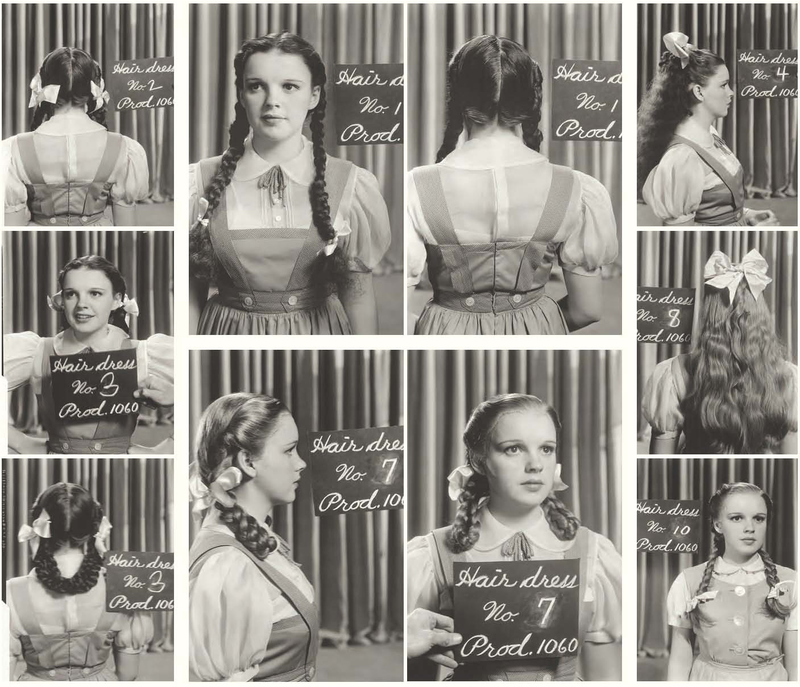 And there is the whole story of Judy Garland. She has to be seen to be believed. The audience wanted to be “in touch” with the star last night and that was the pity of it. Some could not hear as well as they wanted to and the stillness of the Auditorium proved they were giving her their full attention. She sang “Over the Rainbow” as her last number . . . supposedly. But the audience stood up and cheered and screamed for more and Miss Garland shook hands with a few of the people sitting close to the stage. This brought even more applause and more hands reaching out to shake hers. She came back six times, four of those times she simply walked around the stage like a child and threw kisses to the audience, most of them already standing with coats in hand, realizing the show was over but reluctant to leave for fear of missing something. She did sing two more numbers, “Swanee” and “Chicago,” and they did turn on the lights, which probably brought more applause than any song she sang all evening. Now they could see her. Now they could believe her. Photos: The reader review; The original review. October 26, 1968: Judy and John Meyer arrived at “Three, ” a nightclub on 72nd Street & Second Avenue run by singer/actress Mary McCarty. McCarty had known Judy since they worked together in December 1929 on the Vitaphone film short Bubbles. Photo: Snapshot of Judy with Tom Green at Judy’s son’s (Joe Luft) birthday party on March 28, 1968. I don’t have any snapshots of Judy with Meyer.